I made it in, but there was a delay at Shenzhen airport of two hours for our flight. Luckily Shanghai Airlines is a Star Alliance member so I could use my platinum Continental Airlines card to get Samuel and me into the lounge. (Now I sound like George Clooney’s über frequent flyer character in Up in the Air). The terminal at Shanghai airport is brand new. The line at the taxi stand had at least 200 people in, but the sea of available taxi cabs made it move very quickly. 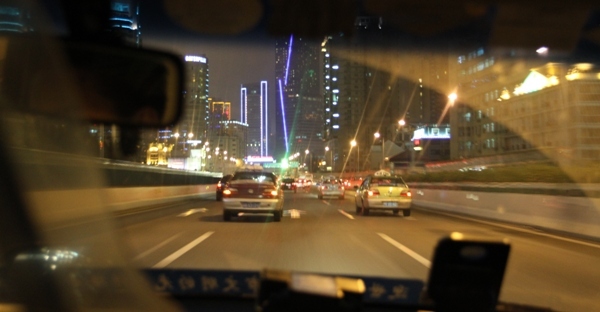 Here is a glimpse of the city at night from the taxicab. Looks like I was mistaken if I thought Hong Kong was the only city with neon trimming on its buildings! My trip to Shanghai is on! I still have jet lag, but I spent the money buying air fare and a hotel room, and there in no backing out. 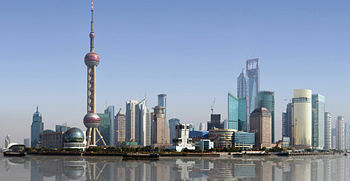 Shanghai is split in two by the Huangpu River (黄浦江 Huángpǔ Jiāng). 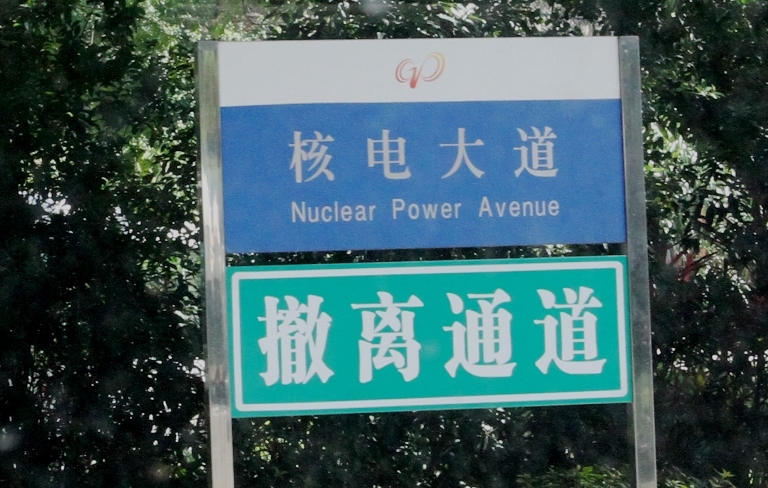 On the west bank is Puxi (浦西 Pǔxī), the older city center, while the newer sky-rise development on the east side is called Pudong (浦东 Pǔdōng). Does the skyline of the Pudong district not look like a colony on Mars? That’s the Pearl Tower, the one with the spheres and I want to go check it out up close. My other mission for the weekend is to travel on the magnetic levitation (MagLev) train. During testing in 2003 it achieved a Chinese record speed of 501 km/h (311 mph). In everyday use on the short track from the international airport it still reaches speeds of 450 km/h (280 mph). I arrive from Shenzhen at the domestic airport tonight, so I will not use the train tonight. I will visit the World Expo on another weekend. It’s right there in the city as well. I forgot to mention two interesting statistics reported in the South Korea news paper yesterday. 1. The individual savings rate has dropped to an alarmingly low level to just above 30% the last year (in the USA it briefly reached 5% in 2009). 2. A large majority of Seoul residents – 75% ! prefer to live in high-rise apartments to living in a house. City officials want to reverse the trend to make the city more livable with open spaces, and will provide more community resources typically found in high-rise aptments, such as day-care centers, health clubs, and the like. Back at work! It’s been a lo-ong day. Lots of work the next two weeks, and I have so much to catch up on. I may very well have to work this weekend but maybe I can dodge it and stick to my plan to go to Shanghai. A quick post because I have to get to bed! I’m at the airport hotel in Hong Kong. The border is closed this time of night so the driver will pick two of us up in the morning and we will go directly to the office. 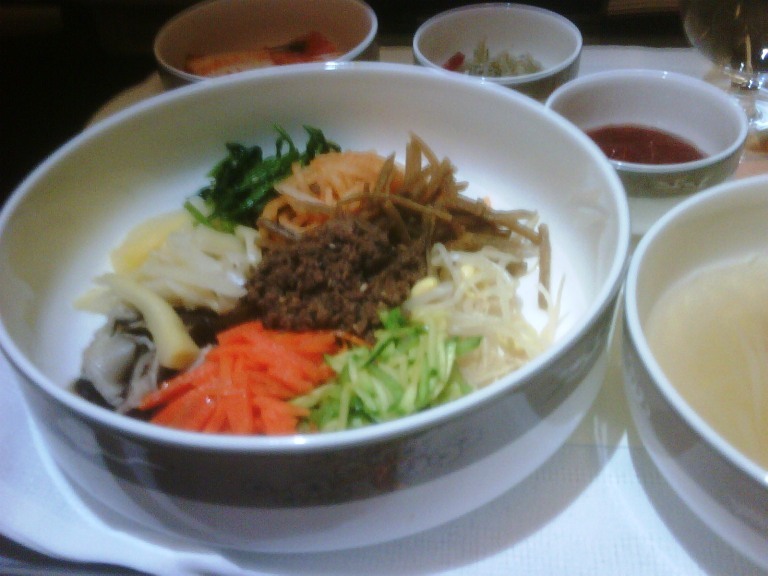 The Asiana Airlines flight went well .. the stewardesses are very sweet : ), the seats are not quite as nice as the other airlines I have flown so far, but the food was great. I took a snap of my traditional Korean dinner : bibimbap which literally means “mixed rice.” Bibimbap is served as bowls of warm white rice, and namul (sautéed and seasoned vegetables) and gochujang (chili pepper paste). So I added the rice to the veggies, added some sesame oil and the pepper paste and stirred it before eating it. (My dish had ground beef, I saw online it could have egg in as well). Very good. 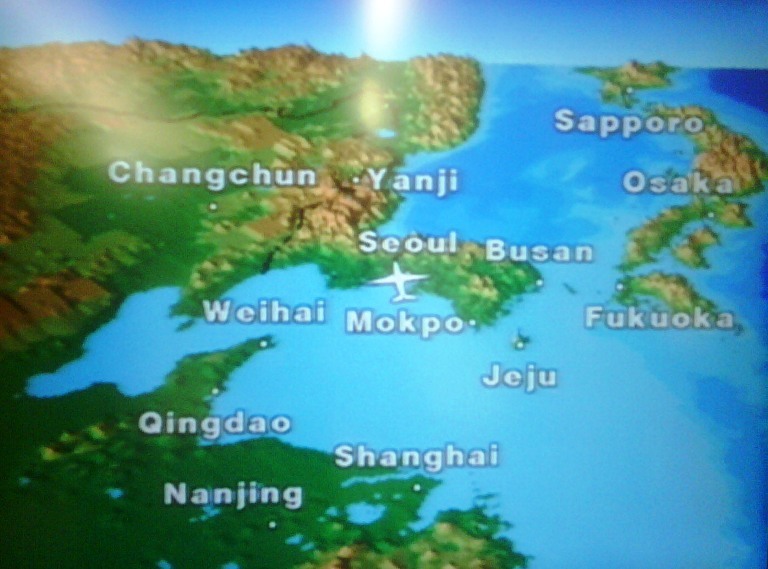 The second picture shows us as we are heading out of Seoul on the Korean peninsula to Hong Kong. (South towards the bottom of the picture). 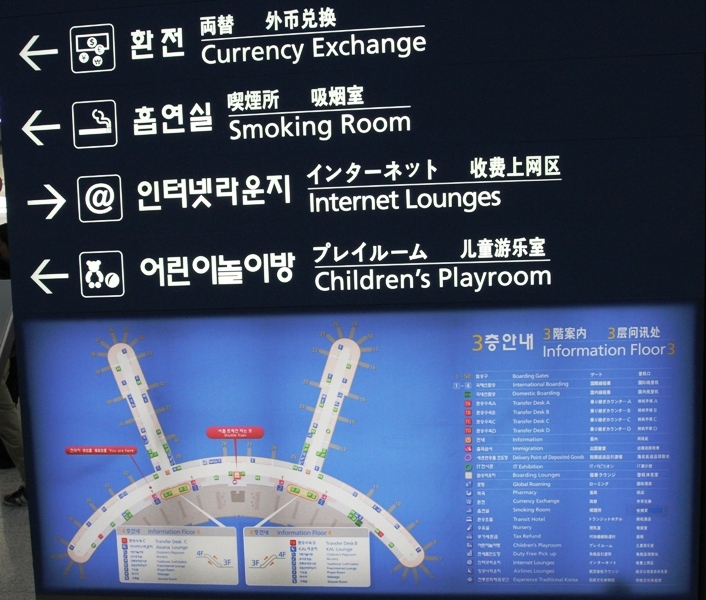 I will post a few pictures of the Incheon airport in Seoul later. 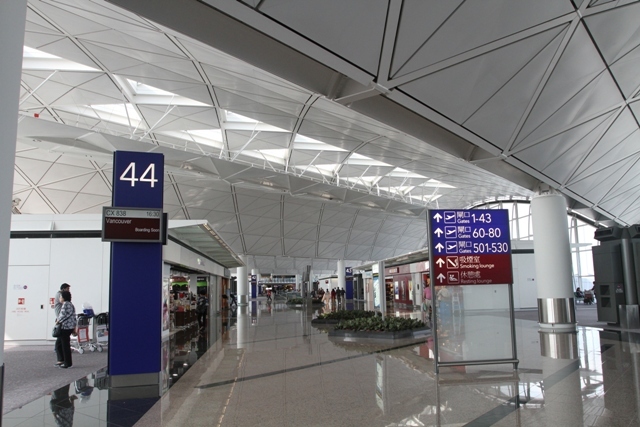 It’s compact, much much smaller than Hong Kong’s airport of course. But very nice inside. I’m at Seattle airport’s South Terminal in the Asiana Airlines lounge. People dress so strange, I thought as I checked them out on the shuttle train .. one guy had shorts and flip-flops on (I would never fly with flip-flops), another wore black aquatic toe-sneakers (like a glove, only for feet) – making him look like the Creature from the Black Lagoon. Here’s a new sign that made me smile on the way to get my Starbucks coffee this morning early : for a ‘Designated Canine Defication Area‘. Hmm. 1. Defication should be defecation 2. Could the sign not just say ‘Let your dog poop here’ ?. 3. 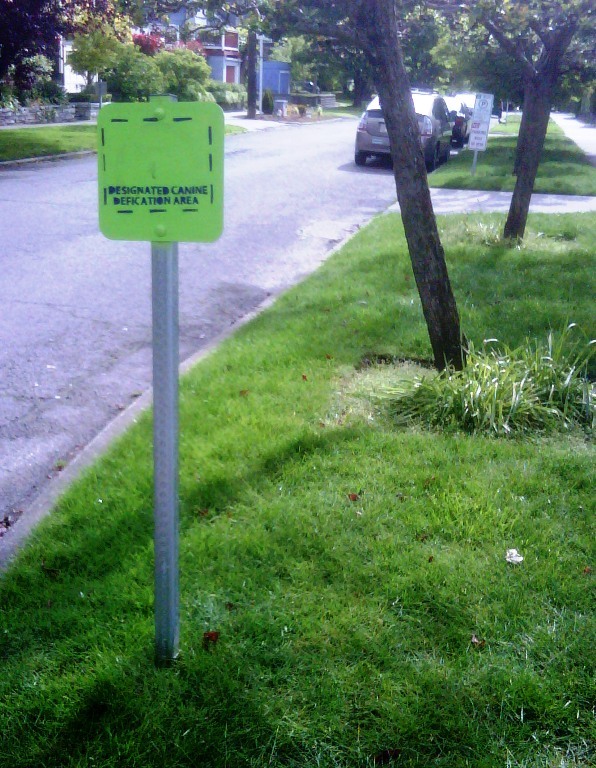 Not sure why a designated area is needed .. dog owners in Seattle are generally very good at picking up after their dogs. Sunday is racing to a finish (I thought Sundays were meant to go by slowly) but I have most of my things together for my trip tomorrow. The Asiana Airlines website wouldn’t let me check in on-line, so I will go to the airport a little earlier (I did confirm the reservation on the phone). 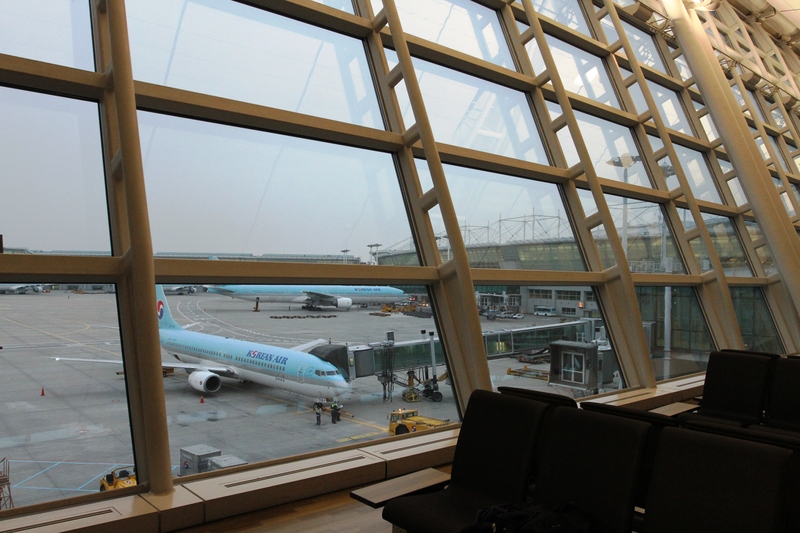 It will be interesting to see what the inside of Incheon International Airport in Seoul looks like, where I connect to the flight to Hong Kong. 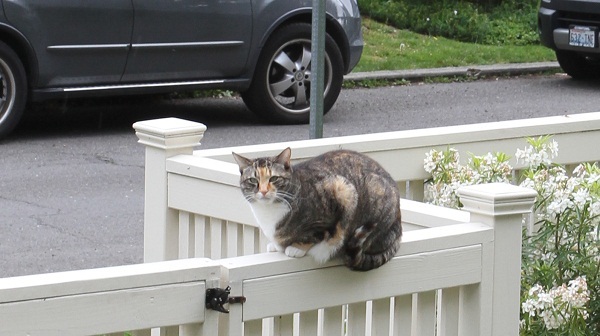 The cat is the neighbor’s, it slipped into my garage at one time and the neigbor had to come ask me to open the garage door. So watch out! kitty kat, don’t go in there. I did have a spare house key made, and I put it in a ‘secret’ place. Here’s a series of cell phone pictures I took yesterday on my walk down to the gym. (I promise I will post glamorous Hong Kong like night-time pictures of Seattle at another time!). Time to take in my Stradivarius to the violin shop? 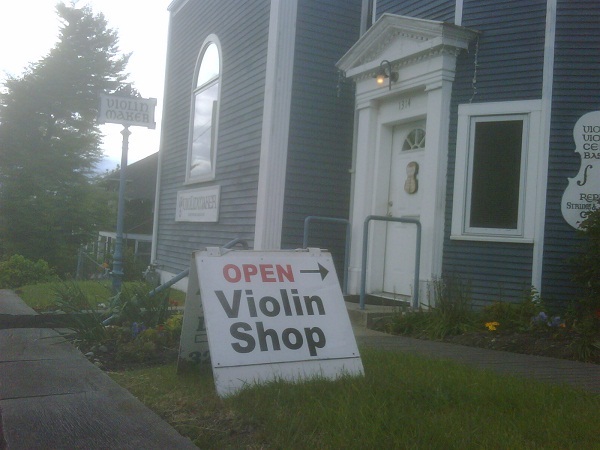 If I had one I would surely not take it just any old violin shop! These famous violins were made in the ‘golden period’ in 1700-1720, and they sell for $2million – $3million at public auctions. 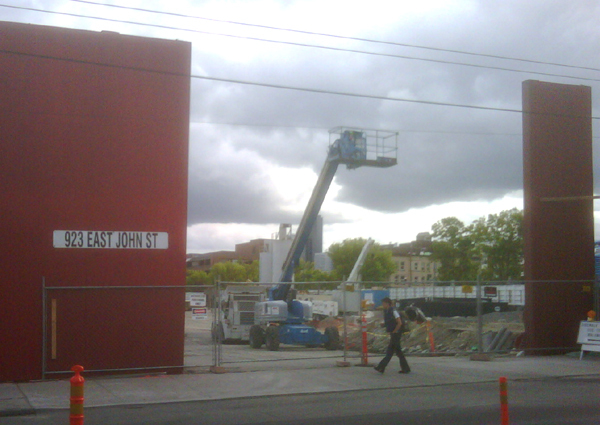 Construction continues on the Capitol Hill light rail station and tunnel. Slated only for opening in 2016, though! 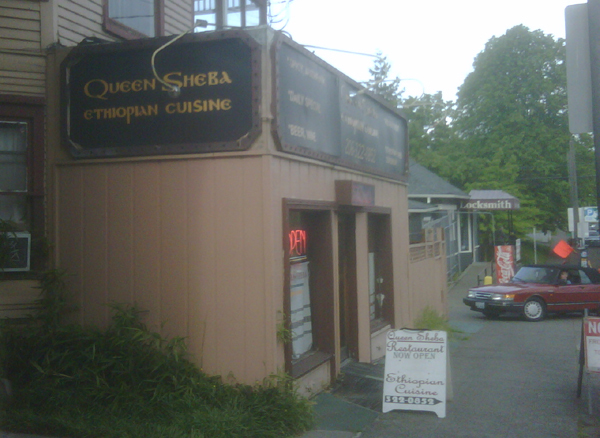 I have never stopped in at the Queen Sheba Ethiopian restaurant to sample their cuisine. Traffic on the I-5 Freeway surprisingly light in the downtown area for a Friday afternoon but I assure you it’s heavy going up north and down south ..
.. so why not ride your bike to work, Friday being Bike To Work day? F5 provides IT infrastructure to other companies, and just for fun I checked in to the ‘Now Hiring/ F5.com/careers’ on the billboard. 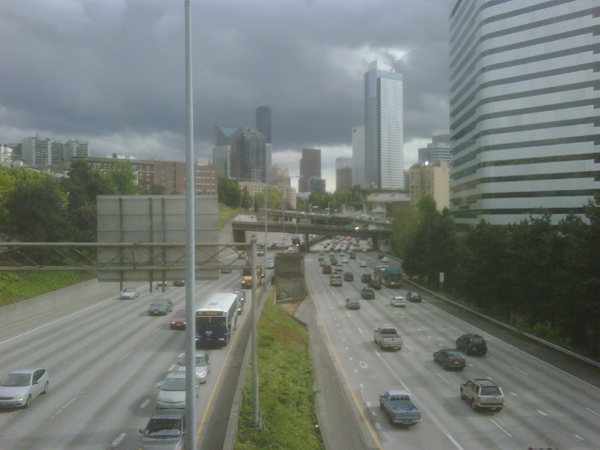 The one business analyst position available in Seattle says ‘Experience with CRM applications, specifically Clarify is a plus’. I have no idea what Clarify is or does, but now I am going to find out! 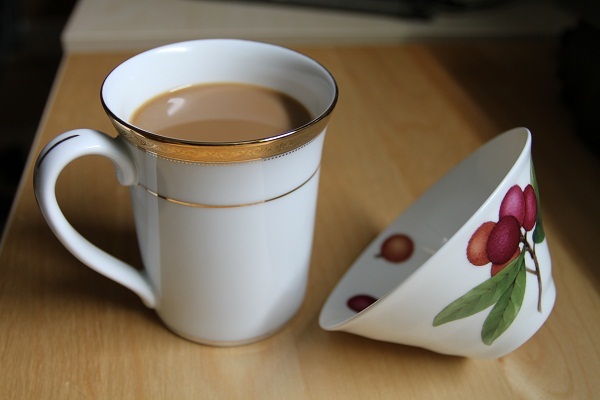 My morning coffee comes in a fine china mug by Noritake, and I used the photo to show a bone china bowl I bought at the same Sogo department store in Hong Kong. It’s beautiful, I said of the bowl to the salesperson, but what does one use it for? Oh, anything, you can drink tea out of it as well, she said. I will have to try it for tea, then. The tea can just not be too hot. 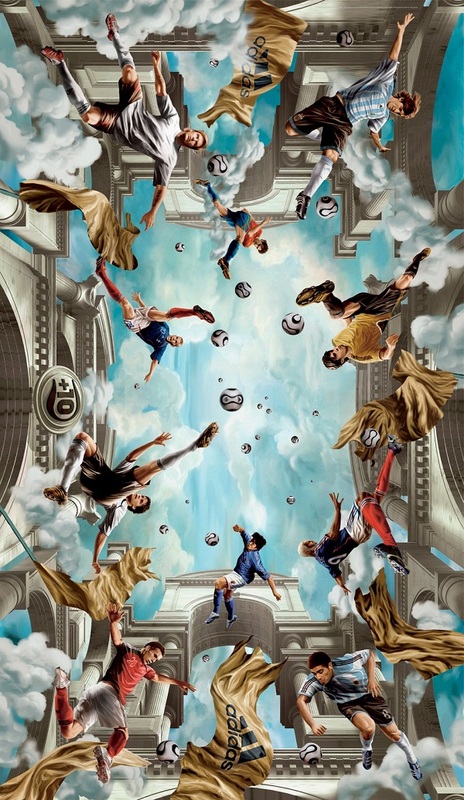 Since the opening of the 2010 World Cup is 3 weeks away, I thought the picture from the fresco in the train station in Cologne, Germany is in order. I cannot name all the soccer stars but the two guys in white could be David Beckham (England, of course) and Michael Ballack, German star that announced just this week he cannot play due to an injury. Seriously. For our China work permit applications which we are finally getting. Looks like Willem translates to William translates to Wēi ​lián (symbols below). My last name is a problem, since there is no direct translation available. I will call in the help of my Chinese colleagues. A person’s last name is actually used to address the person in everyday conversation in Mandarin, and the last name goes first. So a person we would know as Keng Wang will be addressed Wang-Ken (pronounced in proper Mandarin it sounds more like Whung- kuhh). So I have a little more legwork to do but I will let everyone know my full Chinese name, rest assured ! A five-country committee announced Thursday morning in Seoul that they had concluded a North Korean submarine fired a torpedo that sunk the South Korea warship in March. The White House backed the report issued Thursday in Seoul, saying it “points overwhelmingly to the conclusion that North Korea was responsible for the attack.” North Korea would have nothing of this, and reacted belligerently. Why do I keep my eye on it? 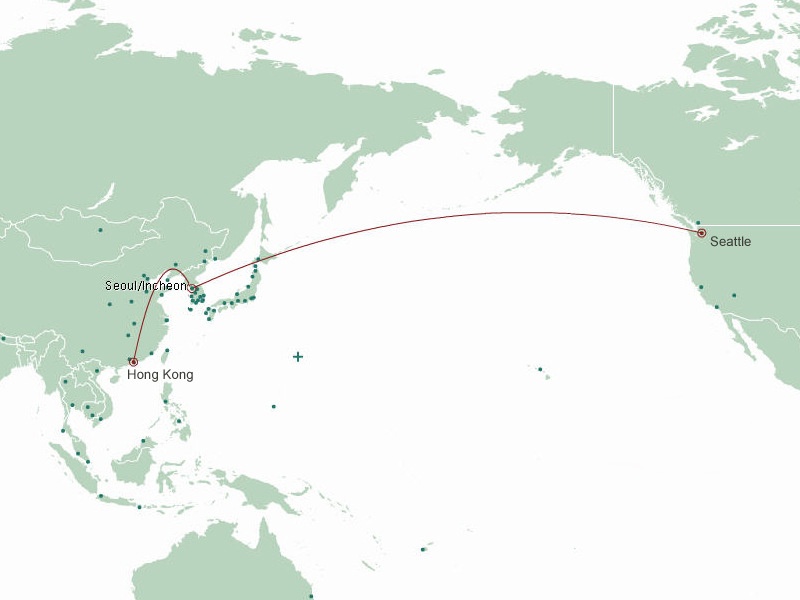 Well, I get to Hong Kong on Monday by flying from Seattle to Seoul and then on to Hong Kong. 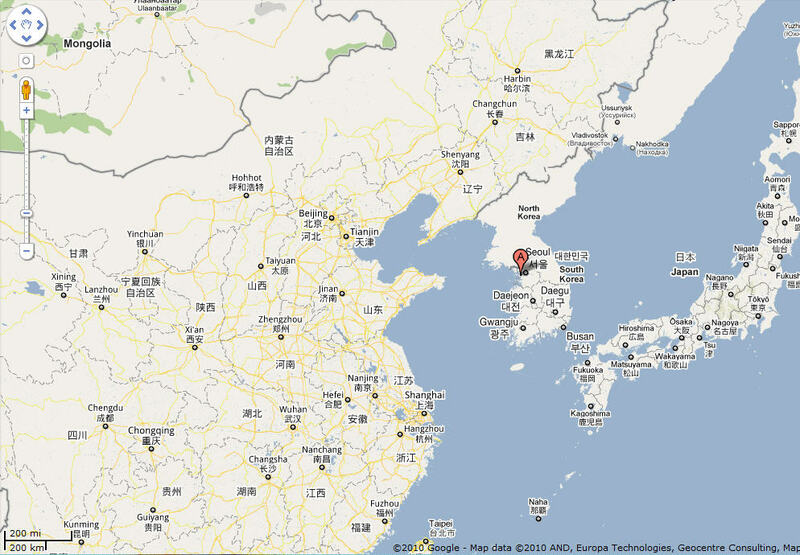 The two Koreas sit on a peninsula between Japan and China. (One would think that North Korea cannot afford to throw its military weight around, but it does). Double-click to enlarge the map, courtesy of Google, of course. 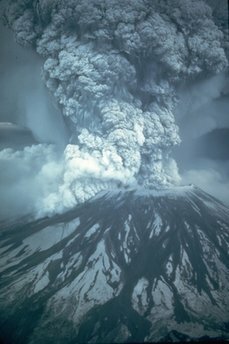 .. of the eruption at Mt St Helens (archive photo below). The eruption occurred at 8.32am on May 18th, 1980. 57 people were killed and the ash plume went up to 80,000 ft, encircling the earth in 15 days. Strangely the reports today mention nothing about it disrupting air travel the way the Iceland volcano still does. Maybe the Mt St Helens ash was very high (commercial aircraft fly at 30,000 – 40,000 ft), maybe everyone back then was blissfully unaware of the potential dangers of the ash? I’m just speculating. I ran more errands today, bought a short-sleeve shirt for work in China (don’t have enough of those), checked out the iPad at the Apple store (very nifty, but more than one person remarked ‘I thought it would be bigger’) and checked in at a store that sells bookshelves (we call them book cases here in the USA, for my South African readers!). Of course they can only deliver it when I am away again. Here is a table runner I bought in Hong Kong. 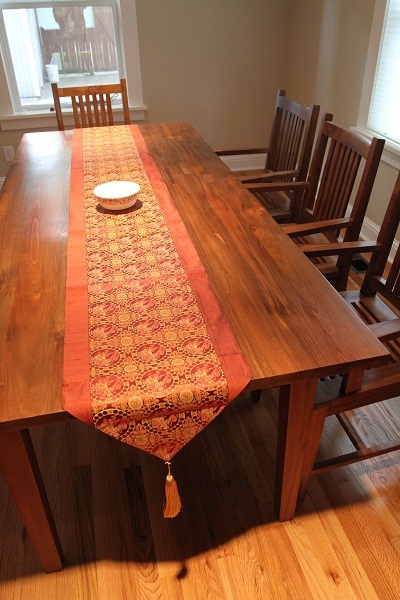 It’s silk and a good thing I remembered the dining room table is 8 ft long so I could get the right size. There were gaudy greens and pinks and yellows to choose from but I went with the toned-down brown and gold .. looks nice, not? Of course the runner can be put on top of a table cloth as well, to dress it up. Copper river salmon is here! It’s available only 3 or 4 weeks per year, and it’s very expensive (3 times the price of other salmon). What is special about it? The Copper River flows in the state of Alaska; almost 300 miles in length, it is a wild rushing river that empties into Prince William Sound at the town of Cordova. Salmon that originate in these pristine waters are challenged by the river’s length and its strong, chill rapids. 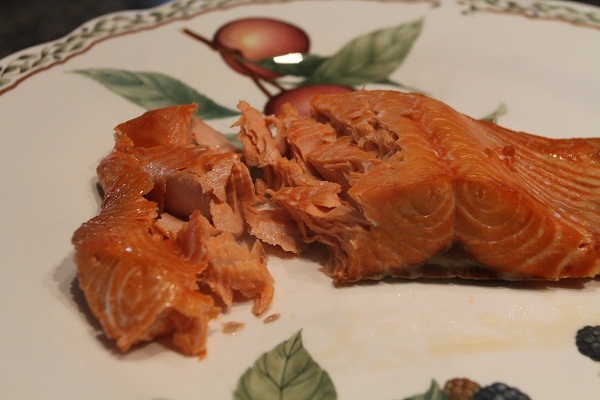 So Copper River salmon are strong, robust fish with a healthy store of natural oils and body fat – making them among the richest, tastiest fish in the world. So I felt obliged to get some, and here is my dinner : ) .. I like my salmon plain : sans even butter or lemon juice. I didn’t have green asparagus that I usually stir-fry as the veggie to go with it, so I threw in some potato bread toast with marmalade. Life is strange .. 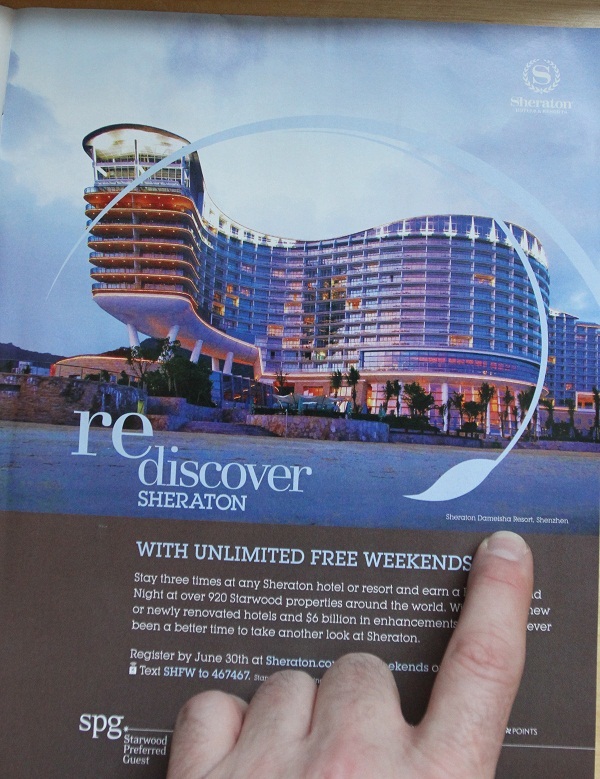 I flipped open the TIME magazine this afternoon that landed in my mailbox, and lo and behold : of all the properties the Starwood company could advertise in my TIME magazine this week, they picked the Sheraton Hotel in Dameisha, China. My aptment is 1/4 mile from the hotel, and the concierge there sells me the bus ticket to go to Hong Kong. 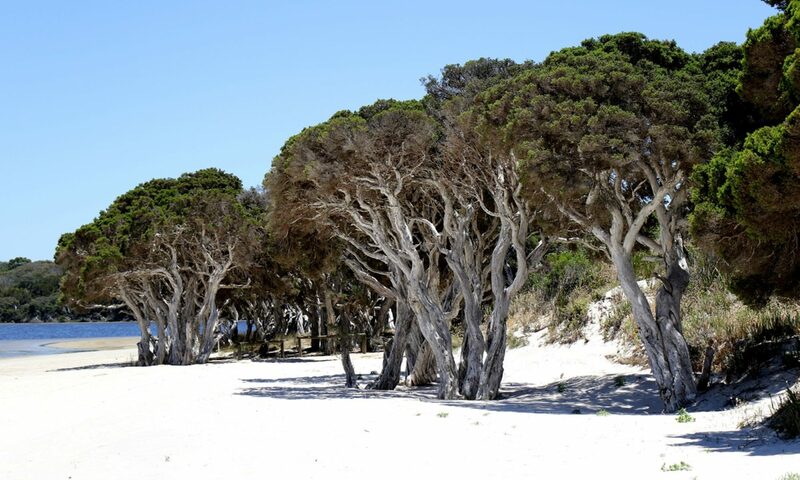 It’s a gorgeous property, on the beach and well-kept. I took the picture below in January. 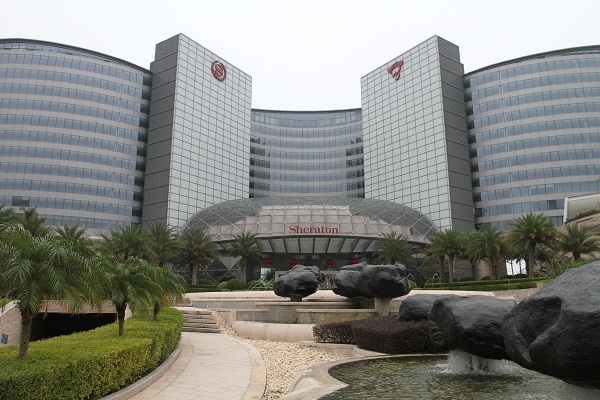 I can definitely recommend the hotel but the surroundings is not nearly as great as say – that of the Sheraton on Nathan Road in exciting Tsim Sha Tsui area in downtown Hong Kong! But then a visitor to Hong Kong instead of Dameisha would not be able to walk over to my place for a TsingTao beer! .. aww. The jungle out front has been tamed (I mowed the lawn and trimmed the edges). I also picked up the mail, got some groceries, swept the deck, took the car to the car-wash and filled it up (thinking of the on-going disaster in the Gulf of Mexico as I did that) and took a 2-hour nap! Tonight my ‘home buds’ and I went to one of our usual watering holes, the Elysian Brewery on Capitol Hill. 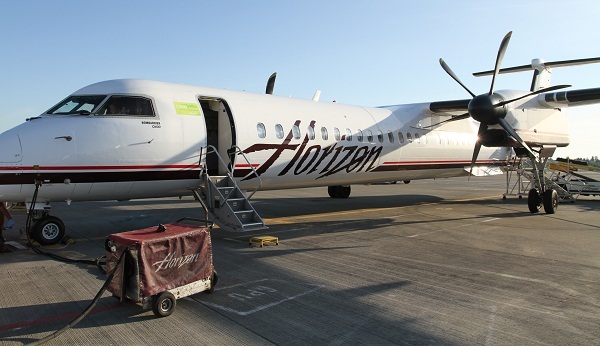 Below is the Bombardier turbo-prop that brought me to Seattle from Vancouver. The sky was again as blue and cloudless today, as it was yesterday. Ohh, the little surprises that one runs into sometimes. They can stop you in your tracks. Like this one : I’m at my front door after 24 hours of travel across the continents and oceans of the globe.. then I discover that my house key is in China and that I don’t have access to a spare key! I had to wait awhile before my very good friend Bryan could come to the rescue, but all’s well that ends well. During the time I sat on the steps of my porch, a 2010 US Census worker stopped by twice, wanted to know if I knew where my neighbors were, they haven’t sent in their census form. (I didn’t know, of course. Looks like the track people down physically if you haven’t sent in your questionnaire). The new lawn is sprouting nicely, so nicely that it needs immediate attention. I’ll deploy the electric lawnmower in the morning. 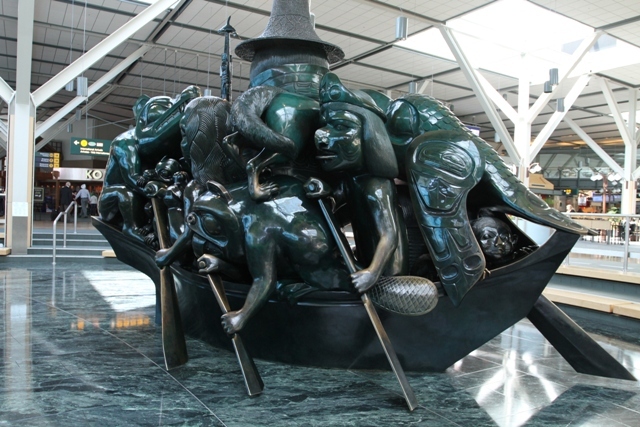 Gate 44 at Hong Kong airport says ‘Boarding Soon’ for the Cathay Pacific flight .. and below that there is some artwork courtesy of Vancouver airport – all kinds of human-animal creatures rowing the boat (check out the beaver – his tail gives him away). I think the artwork wants to say all creatures are in the same boat (aka earth). Soo .. I was treated a little better by Canadian customs this time. Good afternoon, Bonjour! said the guy when I presented my passport. Thinking : Yes. Yes. Don’t you speak Canadian French to me, just stamp the passport. : ) Besides dealing with customs, this Canadian connection is a hassle, because I had to check in again at Alaska Airlines to get to Seattle. It’s a 40 min noisy propeller plane ride (exciting in a way – admittedly). But they also have to transfer my luggage, which increases the risk of it not showing up in Seattle – so if I have a choice (it’s all about getting a fairly priced ticket) I will not use this itinerary again. It’s still a few hours before my flight. This is going to be one of those 36-hr Thursdays again, since I am crossing the International Date Line : ). Here is the view from the 10th floor in the Marriott Hong Kong Skycity on Lantau Island where the Hong Kong airport is. 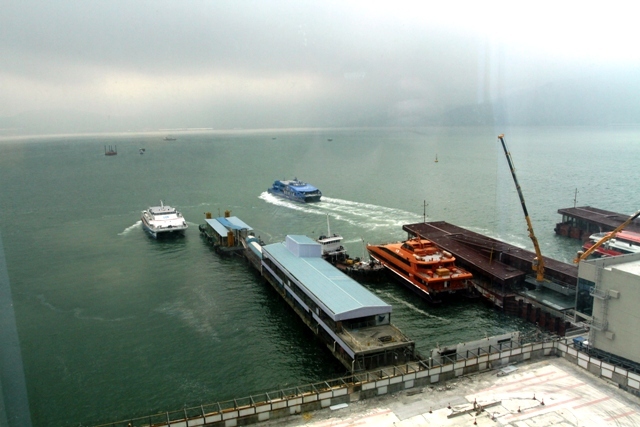 The blue catamaran ferry is headed out to Victoria harbor in Hong Kong; I have seen it several times there. Take a look at this Hong Kong subway picture. 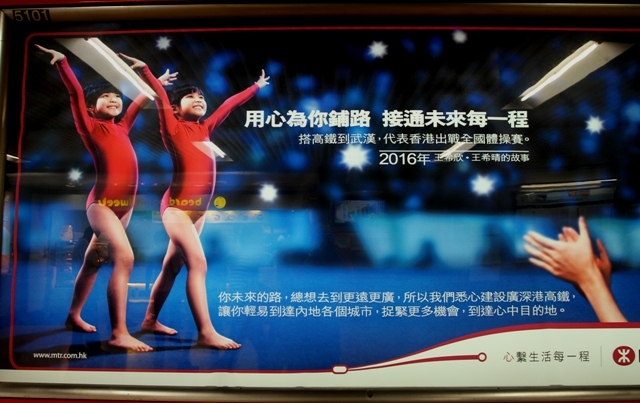 Remember the controversy over the ages of the girl gymnasts at the 2008 Beijing Olympics? So how old are these girls in the picture? 1. Hard to say. 2. 2016 is a long way off, and of course they only have to be the legal age at that time. But are they really happy? And will they look back much later and find out the hard work was worth it? We are working a full day here until 6 pm but a van will take three of us to the Marriott Skycity tonight. My mates will have cheeseburgers and I will have grilled salmon – just to get me tuned into the Pacific Northwest state of mind. I would have been there already (in my mind) if it were not so hectic here at work. It’s not a prison, of course ! but boy – it gobbles up time and energy that leaves me completely ready to just leave it all behind, and just say ‘See ya, you’re on your own for awhile’.